Which is your favourite fish and chip restaurant in Bristol? For me, Catch22 on Park Street is up there. Located just opposite College Green, it’s half-takeaway, half-licensed restaurant – and since opening four years ago, it’s still going strong. With the in-laws visiting, we were after a quick and easy weekend lunch with both healthier and more decadent options, and somewhere that was family-friendly, too. Catch22 fitted the bill perfectly. While Catch22 has embraced the sea theme in its restaurant decor, they’ve managed to get it on the right side of the tasteful/tacky line. Flyers advertising wreck sales and framed sea-themed movie posters sit alongside pirate-related prints in driftwood frames in every semi-enclosed booth, the whole lot topped off with artfully draped netting on top. There’s two tables per booth, giving diners a semi-private dining experience. It’s a tiny restaurant, though, so fitting the pushchair and highchair in along with four adults without blocking the path through to the toilets was a struggle. The menu’s changed a bit since we last visited, too. As well as the regular battered fish (plus halloumi, chicken and pea fritters) there are breaded choices for something a little healthier. There’s also a selection of fish without batter, along with salads, burgers and pies – plus both alcoholic and non-alcoholic drinks, the former (our waiter told us) popular on Friday and Saturday nights when the restaurant has more of a party atmosphere than at lunchtimes. Of the four adults there, two of us had bigger appetites than the others…so it was the large haddock (£9.50) and chips that swayed us. Beans on the side for me, too – mainly because the baby loves them, and I knew I’d have to share. On the other side of the table, two members of our party chose from the “lighter” section of the menu: fresh fish (no batter) with a choice of sauces and three different heat levels depending on taste – not too dissimilar from a certain chicken restaurant just up the road. Their fish was beautifully cooked, and the sauce tasty enough – but the plates were swimming in it and it was a bit too greasy for their liking. There’s the promise of vegan “fish” and chips on its way too, which will add to the range of vegetarian and gluten-free choices already on offer. 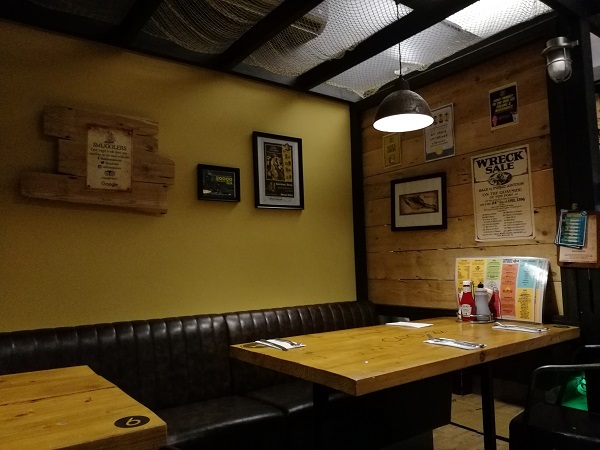 We were impressed back in 2015 when we visited Catch22 for the very first time, and we’re still fans in 2019, too: it’s great to see how the place has evolved into a fully fledged restaurant. 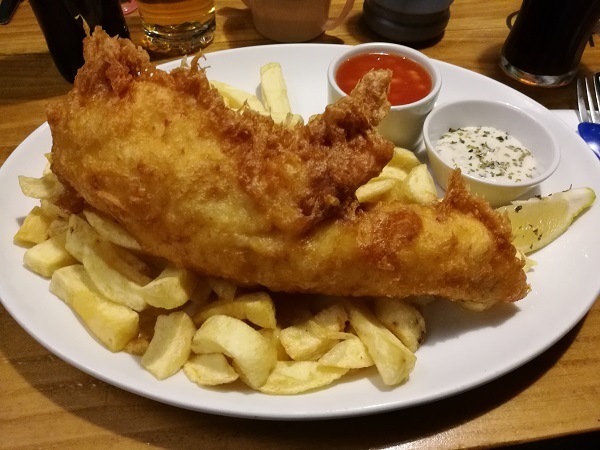 The restaurant’s a lovely place to sit and eat, but there’s a big discrepancy in prices between the dine-in and takeaway menus – so if the weather’s nice, grab your fish and chips to go and head over to College Green just over the road to enjoy it.